This gorgeous tote, an update to the very popular della q striped lilly, features a beautful stripe tpped with a band of iridiscent silk. 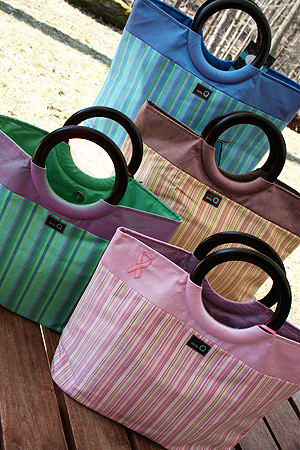 In 5 standard colors, plus two special limited edition colors (*), this tote can handle 2 - 3 med/small projects, your laptop, ipad and more. 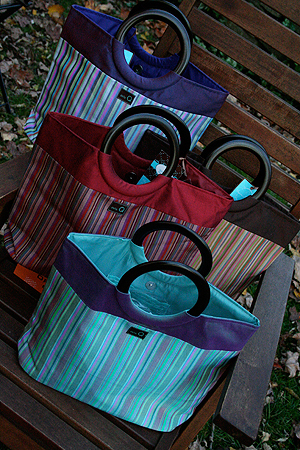 Fantastic carry around tote for any knitting project, plus internal storage for things like cel phones, scissors, etc. Add a matching case or pouch and you're all set to move and knit! ITEM WHEN YOUR ORDER TOTAL IS $75 OR OVER. 14.5" w x 4" w x 10" h. 100% Silk.